If you saw the post on my trip and culinary adventures in NY, then you’ll recognize the name of this dish. If not, I’ll tell you that I had a wonderful meal at a restaurant in SoHo… Slow Cooked Salmon with Corn Pudding and Cherry Tomato Vinaigrette, which was mouth-watering delicious. I decided to make this mostly because I was reminiscing of that dish, and wanted to try making it at home. You might think this recipe is like a traditional salad dressing because of its title, but that simply is not the case. The cherry tomatoes are cut in half, and remain in tact which makes it a nice accompaniment to serve with fish, steak, and chicken, but would also be great in a salad. 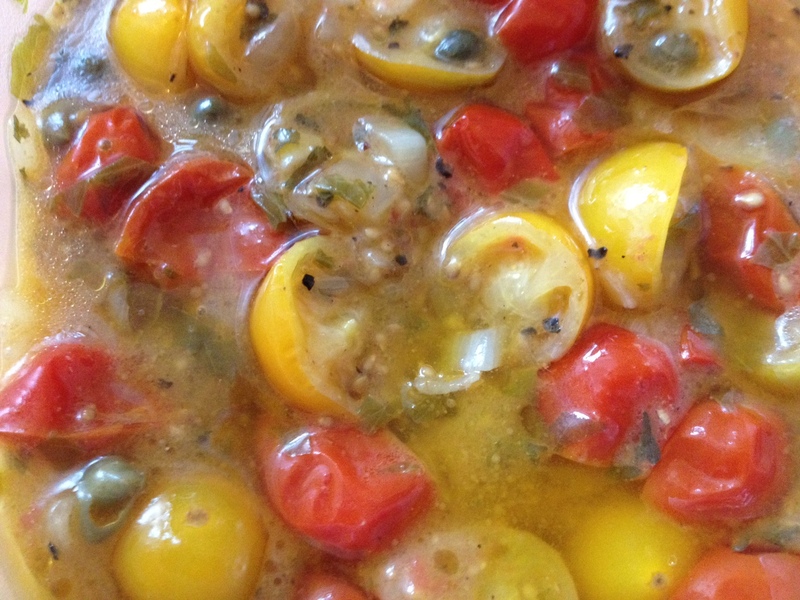 In a medium bowl, stir together the shallot, vinegar, capers, tomatoes, and 1/2 teaspoon salt. Let that stand about 10 minutes, then stir in the olive and canola oil, parsley, basil, cumin, and pepper. In a large skillet over medium heat, add the vinaigrette to the pan, and bring just to a simmer, stirring with a wooden spoon. Cook until the tomatoes soften, about 5 minutes. Spoon the sauce over desired dish and serve. This entry was posted in Recipes, Sauces, Condiments, & Marinades, Vegetarian and tagged basil, capers, cherry tomatoes, cumin, parsley, red wine vinegar, shallots. Bookmark the permalink.